At first glance, I think it is alright, but somehow something doesn't ring straight to me. I decide go over it again. And whoa… more than half of what I wrote and sent them is not even there. Alright, I know editing is always needed in media, and even sometimes for an online publication though they have no costs of paper or printing etc.. So I am thinking that maybe this is OK--but upon closer examination, that is not at all the case here. What they took out was in fact very specific and calculated. Indeed, anything their advertisers might not feel good about. And as some of their advertisers are world leaders in unsustainability, pollution, and unethical practices, that might create some problems with what I really had to say to their questions. 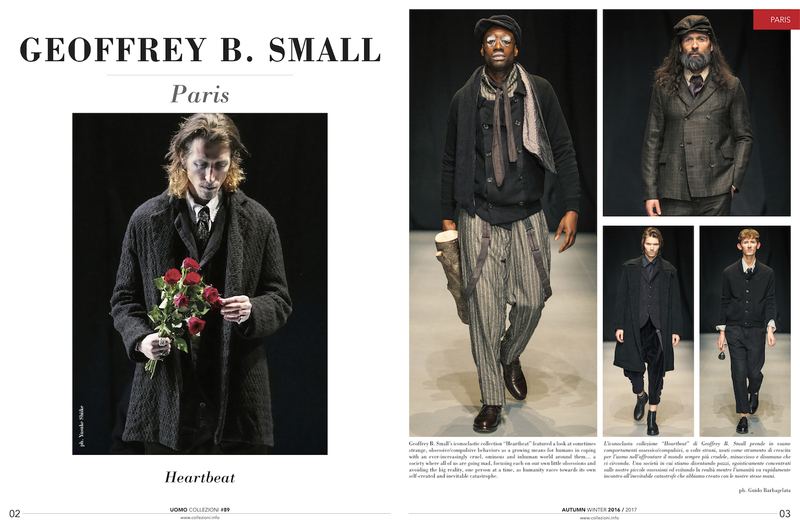 So for the record, exclusively here on StyleZeitgeist.com here is the interview published in full with my answers (yes, I must use the word here) uncensored…. Geoffrey, thank you for posting the entire thing. 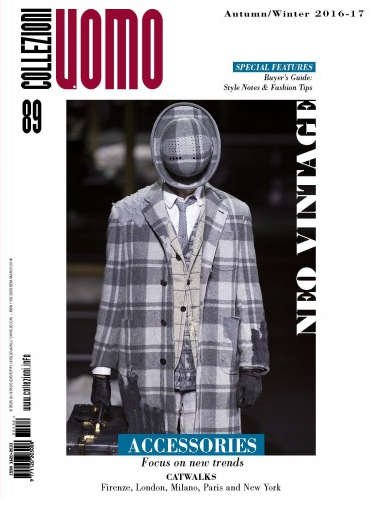 AnOther is well-embedded into the fashion corporate system, while still masquerading as an indie magazine. Read this Vestoj article on Jefferson Hack, owner of AnOther and Dazed. 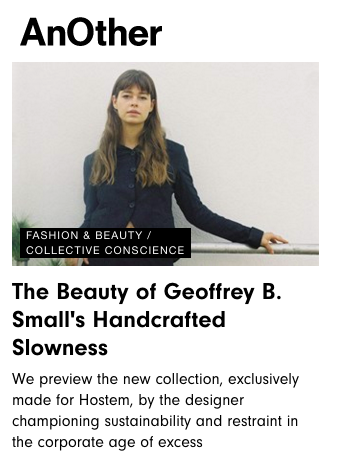 I've seen this interview because Hostem posted some photos from it (and Hostem was the first shop which introduced Geoffrey B. Small's work to me) and this interview was lacking indeed. I am happy to be able to read these complete answers, thank you! Extremely happy with everything about my most recent purchase from Geoffrey's amazing collection. 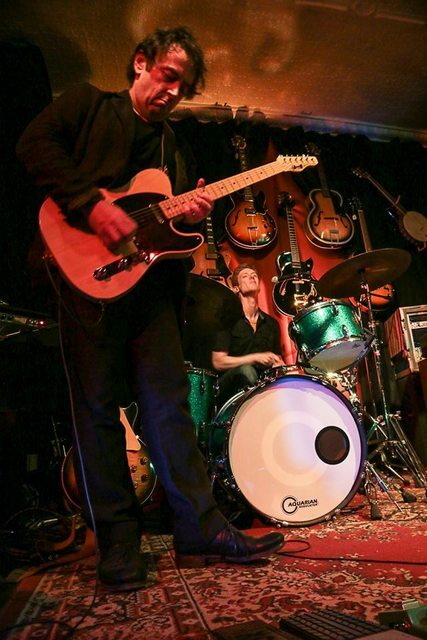 Thanks to Persuade in Bilbao for helping make this happen. We have been working non-stop for months on this record season and have now finished the last of all the beautiful pieces we have accepted to produce for SS2016, and are continuously amazed as we have been receiving incredible sell-through stories among our worldwide dealers throughout this entire record season for production demand of our work, whenever deliveries are able arrive their stores. For example, one dealer's delivery received only 3 weeks ago is sold out, another in Japan received 2 weeks ago sold out 50% of their delivery in 2 days, another a week ago sold the first jacket only 15 minutes out of the box and an incredible 24% of the delivery was sold in the first day and a half etc… These are incredible figures in an industry plagued with excessive seasonality, planned obsolescence, chronic markdowns, and an estimated one-third of world production of clothing never ever being bought at any price. Clearly, we are making enormous progress in our mission to build a leading sustainable non-seasonal collection concept with extremely exclusive and limited distribution that focuses on one simple goal: making the best clothes humanely possible in the world today. And because of this extreme growth and sales of our company in recent seasons, we decided in March that we are not doing any press presentations for the SS2017 season. Our organization has been increasing rapidly to meet demand and we must focus all of our time reorganizating many parts of the firm to manage growth and demand in the coming years. Over the last ten seasons, our sales and orders have increased by more than 50 percent in the world market annually, but in the last 2 seasons, growth was even higher… setting all-time records and despite aggressive hiring and expanding of our workroom team staff -our production capacity has been able to meet only about 80% of the new order levels of demand in these seasons, and we have canceled a significant amount of orders (totaling in the hundreds of thousands of euros) that our production simply was not able or willing to handle. So we have a priority on pruning some of our distribution and increasing more and more production capacity and organizational structure and systems in our workrooms at Cavarzere Italy where our extreme handmade clothes are produced. The story of our workrooms and our company is also attracting more and more attention among smart cultural, economic and business people in Italy. As one of the few firms aggressively hiring people in a country where unemployment officially among people 30 years old and under is way over 40 percent, I have been invited to speak at no less than 3 major leading universities in Italyin the past year (the Facolta` L'Economia at the University of Padova, the Fondazione CUOA in Vicenza and the IUAV University of Venice) about our phenomenal, and yes, radical new approach to design, management and business in the fashion world. The fact that the majority of fashion industry press and media remain ignorant of this story is no problem for us. We don't need them and indeed, our model is based upon the opposite of theirs. Like politics today, what you see in the media is light years away from the reality of what is happening on the ground. And in the end, what is happening on the ground is what is happening, period. As part of this growth, on June 1st, the legal structure of our company was successfully transformed from an Italian ditta` individuale (sole proprietorship) to an Italian Srl Societa` Limitata Responsibiilta` (similar to the Sarl structure in France or corporation in US) to reflect the new size and number of employees today in the company, as well as to prepare for the exceptional growth and development which we expect in the coming years. 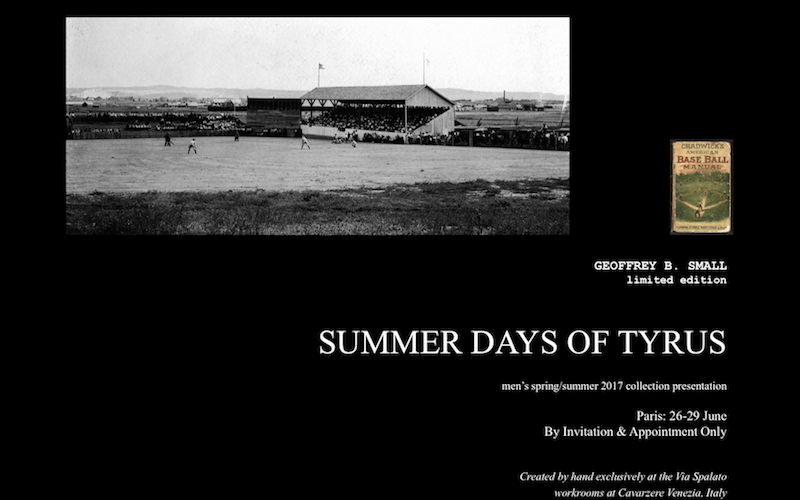 The new company has been carefully named "Geoffrey B. Small Made in Italy Srl" to symbolize our total commitment to our growing investment in the country and its human and cultural resources, and the making of our exceptional products entirely in Italy; and will act as the exclusive completely in-house production firm of our collections for all worldwide distribution. 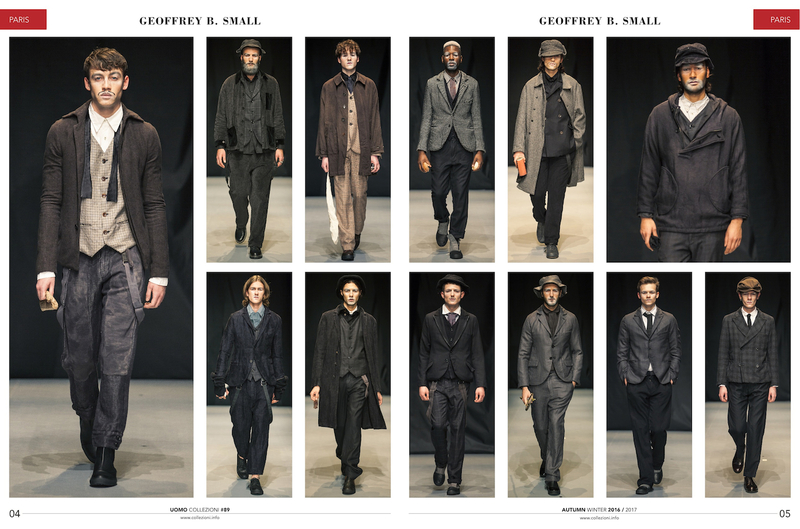 Our Paris fashion shows require a huge amount of time and personal attention from myself and other key people in the company, and with the above mentioned situation and developments, we do not believe that we currently have the organizational size or team depth developed enough to handle all of the major organizational and building changes going on in the firm and the critical sales appointment work with our customers that needs to be done this week- and produce a great show in Paris…all at the same time. Priorities have to be made. Selling our work and promoting it is not our problem at the moment. We can sell every single piece we can make. And demand far exceeds supply. We will spend our time this week on the nuts and bolts of making things and selling things more efficiently and working more closely with our best retail partners to better serve the GBS customer at the retail level. Our major retail partners around the world have agreed with us and supported us in this decision. The collection we have developed and are presenting is one of our most exciting and beautiful to date, with new levels of extreme handmade clothing technologies, sustainability, and ethical creation for menswear direct from our workrooms. There will however, be no press access to the new work, so we cordially invite all interested parties to wait until the pieces arrive at our dealers' stores around the world next season to begin to see and experience them. What is the benefit of producing limited edition collections? 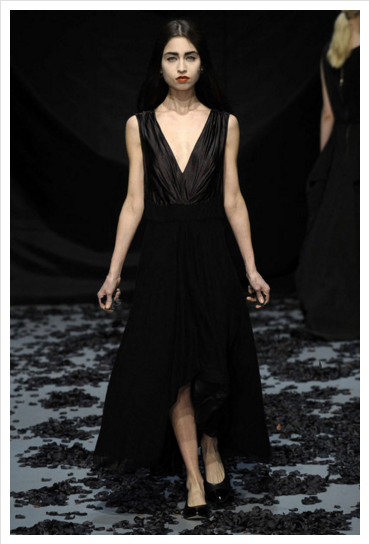 Do you think fashion needs more of that? A recent study has come out that indicates that one-third of all clothing produced in the world is unsold. 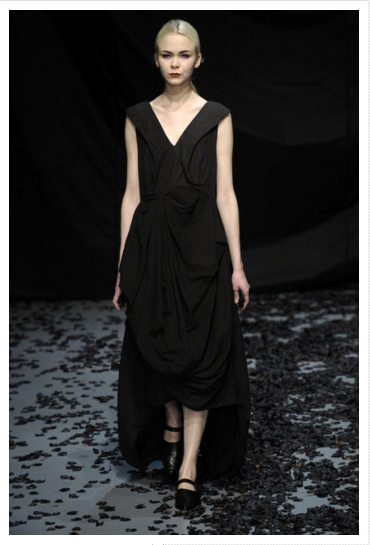 A ”29£" or ”2,990 yen" or “29,99 dollar or euro” article that steals its design from a Paris runway collection, promotes and uses slave labor and consumes a long chain of energy and resources and produces an equally long chain of greenhouse gas emissions in its production and delivery to the marketplace, fits poorly, uses uncomfortable plastic petrochemical fabric, looks cheap, and falls apart after only a month and several washings, and then needs to be replaced and repurchased again 5-10 times a year, and then ends up in an African landfill where its synthetic materials obstruct water flow, degrade topsoil and increase malaria growth or in the oceans all around the world where UK scientists have discovered now contain alarmingly high percentages of microscopic plastic particles most likely caused by our industry… is no bargain at all. It is a waste of money and one of the most expensive, wasteful and destructive things you can possibly do with your money. The business model is totally flawed. Reducing the amount and quantities of product and making things that last as long as possible is a tantamount to the new wardrobe philosophy for those of us who wish to avoid mass extinction of the human species within the next few decades. 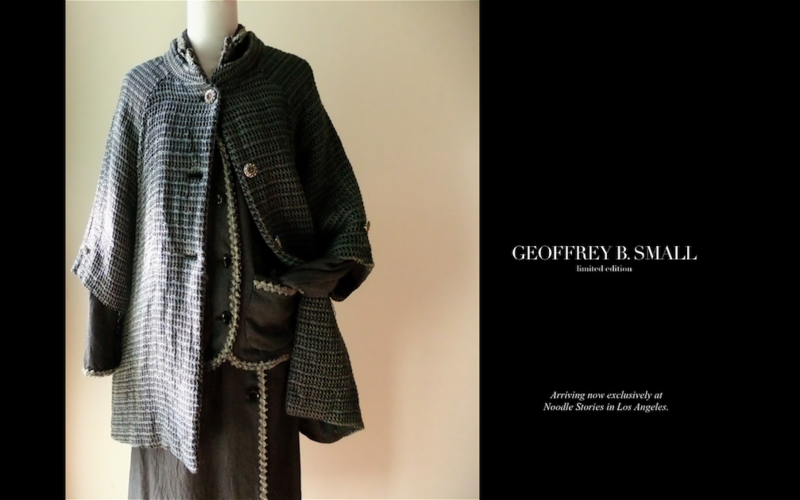 It takes a tremendous amount of skill, time and work to make a Geoffrey B. Small limited edition article, and it is financially and logistically impossible to over-distribute and over produce. Every piece must count for maker and wearer. If making clothing is going to cost more in the future, and it is, it must contain less waste, and that includes pieces that are over-produced on speculation using slave labor tactics and extravagant consumption of energy, water and natural resources. Micro-scale design and high value production specifically targeted to individual niche customers’ exact needs in exclusive and limited series is the logical sustainable, and humane, approach. Dear Oulipien, Sorry I am very busy at the moment working in Paris and your question(s) is rather long, extended and spread out. I would say very quickly that you are seeing things only from one side of a very complex equation and your answers require a lot time and understanding of what we have been doing over the past decades. Suggest you try to read the full thread here first to catch up on some things. Perhaps you are too busy, I understand. I know there is a lot, but that is the point and the reality. We are busy too. In the meantime, I do completely disagree with you about several things. 1. Actually, from a tailor's point of view, every human being actually is a niche customer. Across a wide range of variables, nobody is the same. You may not think you are a niche customer, but that is because you have been brainwashed by living in a system that has and is continuing to dehumanize a lot of things. You speak as if you are just another number, I do not believe you are. So for me to even begin to review and provide my answer to your own case as you began to present it in your post, I would need more specific and complete information including specifics on the garments you are talking about including label information, pricing and where they were acquired or bought, what you do for work and where you work, what other things and interests you have or do in your life that relate to your clothes, what you look like, what you want to look like, what you need when it comes to your clothes, what is the correct budgeting level that you can afford to put into whatever article of clothing is being considered, a myriad of things before even talking about body dimensions and fit, let alone "styling." Believe me, after 40 years of taking care of people's clothes in one way or another, even people who say they "don't care about their clothes at all" actually really do care a lot about them when you really get down to it. So to get to any point that I can provide a competent answer, I would need more information about you and your situation. Hope you understand, I am not trying to pry- but that is what I would need to do my job answering. 2.) Also it took me 5 times to try to understand what I think you are saying, but all those things you think are independent of each other, to me, from where I am coming from, which is the actual making of clothing side... the creation, production and distribution of clothes and the global industry which performs this task... those things are totally integrally connected to each other. They are not separate independent entities. Again, your perspective has been distorted by the norms set by the industrial/consumer era which still remains, and which we, and others are leading an exit or an alternative away from. But again, that requires too much time than I have now. Just wanted to say thanks for graciously entertaining what I realize was a pretty rambly and ill-expressed set of thoughts on my part. I have read a fair amount of this thread but not all of it (it is pretty long) and will try to return with something more coherent. I do appreciate your taking the time. our SS2016 extreme handmade technology 'Examen Reginae' collection in Paris which we have now completed production on worldwide. Noodle Stories (just arrived) and (arriving in next few days:) Cruvoir in Los Angeles, and Worthwhile in Charleston. 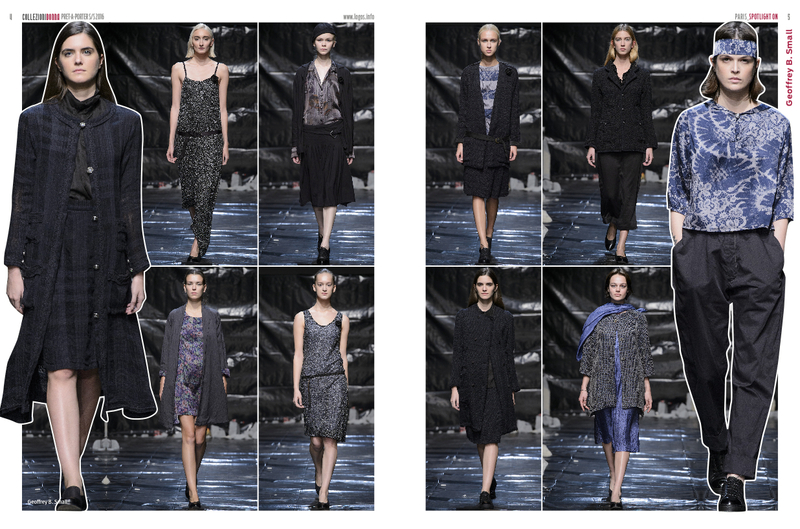 Eth0s in Shanghai will have a special group combined with their AW2016 selections as well. 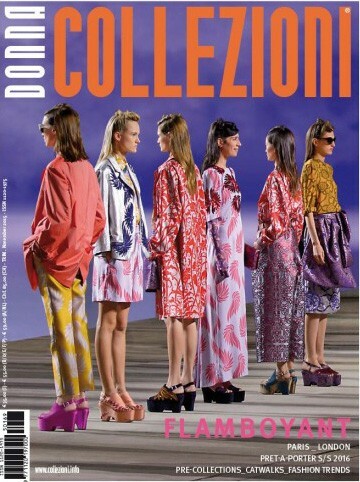 Collezioni Donna is published in Italy by Logos and is the industry's leading print runway show coverage publication. Last edited by Geoffrey B. Small; 07-03-2016 at 10:05 AM. Would you consider any of your pieces unisex? Sadly for me, I think Noodle Stories is the only place near me that has your clothing and isn't appointment only. Thanks for the advice Geoffrey! Hopefully I can swing around to NS. Thrilled to have a chance to wear the matching linen trousers to my GBS EVJ03 jacket. Thanks to Nic at Eth0s (and, of course, Geoffrey and the team) for making this possible. Looking forward to a few more pieces in the coming year. Cheers. 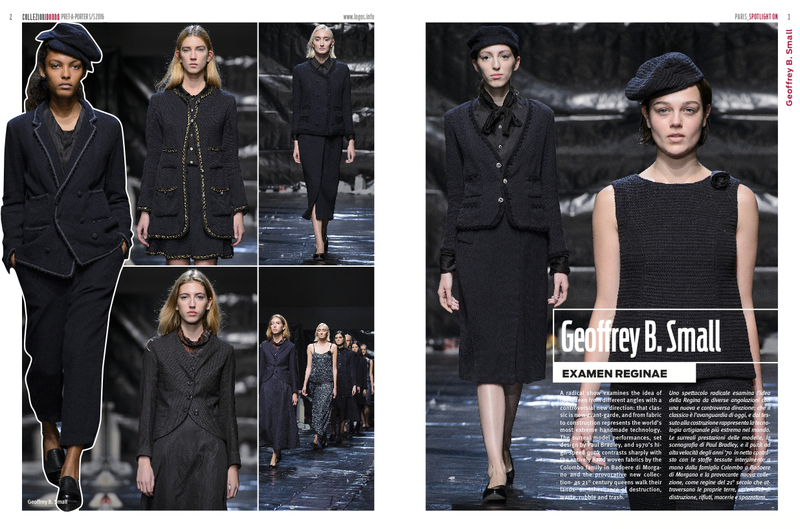 Also up now, coverage from our "Escape" women's AW2106 Paris collection show is on FMAG (fashionmag.com). First deliveries for "Escape" are arriving this month in Shanghai at Eth0s and in September at Hostem in London, Hotoveli in New York and Journal Standard Luxe in Tokyo and Osaka. You can click on the images to see the full photo coverage. thanks to everyone, Geoffrey & the Team..
Could you give any hints of what the different offerings will be for Hotoveli, IF, and the SZ popup shop, and when they will be available? I want to make sure I don't "miss out" on seeing any of your pieces.